What do Queen Elizabeth II, Frank Sinatra, Madonna, Marilyn Monroe and Tom Cruise have in common? According to Brides Magazine, they’ve all had weddings during cold weather months. Just because the temperature is dropping doesn’t mean you can’t have an amazing, elegant memorable wedding in the winter. You can turn your wedding into a winter wonderland with a Skyline cruise. But don’t delay, now’s the time to book your dream wedding aboard our 3-deck luxury wedding yacht, the Skyline Princess. The Skyline Princess is the ideal venue for your wedding. We’ve been in the wedding business since 1993 and we can offer your guests spectacular views of the most iconic sights New York City has to offer. But that’s not all. Skyline gives you a tremendous variety of food options and we can even get you a world-renowned officiant, our dear friend Captain Arnold. If you book now, you can enjoy fall, winter, and early spring discounts for the best value in one of the most unique wedding venues in NY. It costs much less than you think! 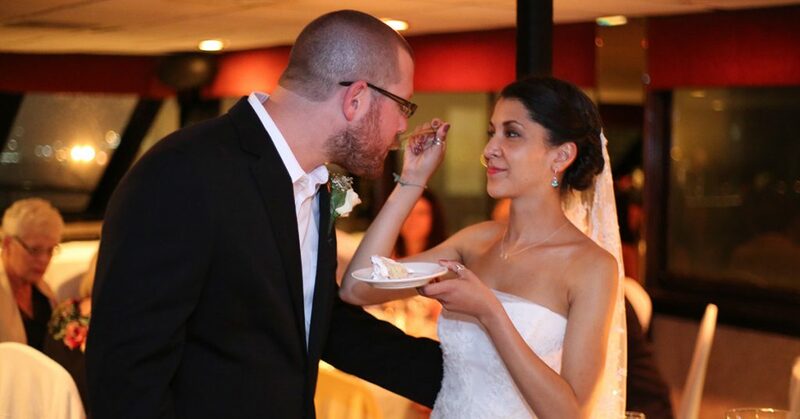 We help plan all kinds of weddings and all types of celebrations aboard the Skyline Princess. In addition to weddings, we’re also the perfect place for Bar/Bat Mitzvah celebrations, Sweet Sixteen parties or Quinceañera. We’ll also handle anniversaries, engagements, birthdays, corporate events and any other event as well. Many of our weddings are full ship charters. Skyline provides full ship private charters from many ports in NY, NJ, LI, Westchester, and Connecticut. But we also rent private decks on our public dinner cruises. It’s a fantastic value. For smaller affairs, we’ll set aside a table or two on one of our public cruises. In fact, for some weddings we only have small parties of just 3 or 4 people. We work with all types of people with all different budgets. If you’re looking to book a winter wedding, you might want to incorporate the theme in the decor of your reception. Adding white crystal and ice sculptures can create winter magic and the Skyline Princess has the space to accommodate you. We’re Coast Guard certified to carry up to 450 passengers and the ship is climate controlled for all types of conditions. We offer private Bridal Suites and our top deck, known as the Skylight Deck can be fully enclosed. It has a dance floor and a DJ space. If you have questions, talk to our event planners. We also offer incredible food options. From an elegant modern yacht style cocktail reception to a more traditional buffet sit down, we can provide you with top notch cuisine. Skyline cocktail receptions offer a choice of six out of nearly two dozen hors d’oeuvres, carving stations, pasta stations, and a bistro table. We also offer a variety of sit-down packages that give you several choices of entrees. Plus, we offer dessert and cake. All of our food is prepared by our in-house chef. A wedding aboard the Skyline Princess means you’ll have the world famous New York City Skyline as a backdrop. Sights such as the Empire State Building, United Nations, Brooklyn Bridge and Statue of Liberty will make your day even more memorable. Skyline Cruises will help you create a stunning winter wedding. To learn more, contact us today.